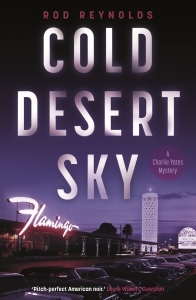 ‘Cold Desert Sky’ is the third novel by Rod Reynolds in the noir series featuring gutsy US reporter Charlie Yates. Set in December 1946, ‘Cold Desert Sky’ is a punchy novel – a cocktail one part fact, three parts fiction – in which Reynolds ups his game and his locale, moving from the rural Texarkana of the first story to Los Angeles and Las Vegas, and steeping the narrative in the heady atmosphere of the Hollywood film industry and the inception of one of Las Vegas’ first major casino-resorts, the Flamingo. Yet, despite the gaudier surroundings, Reynolds doesn’t’ shy away from exposing the suppurating underbelly of the twin cities of angels and sin, populating the novel with mobsters, pimps, racketeers, unprincipled movie moguls, corrupt property developers, bent cops and sleazy reporters. And the sorry string of men and women whose dreams are mercilessly snuffed out by these sharks. Wading through all this is Charlie Yates, the gritty young reporter introduced by Reynolds in ‘The Dark Inside’ and its follow-up, ‘Black Night Falling’. Charlie is nosy enough to occasionally land himself in deep trouble, but he is also endowed with enough resilience, survival instinct and ability to think on his feet to extricate himself from trouble – if not exactly unscathed. Reynolds writes with an assured hand, penning a gripping, flawlessly timed narrative and a clever, elaborate plot that weaves together three main strands: Charlie’s quest for two missing would-be starlets, his desperate efforts to get himself and his wife Lizzie out from under the menace of LA gangster boss Bugsy Siegel and his henchmen, and the FBI’s relentless hunt for Bugsy Siegel, to which Charlie becomes an unwitting party. The novel is peppered with an assortment of well-sketched characters, most of them fictional and some, like Siegel, all too real, and enough of them are sufficiently ambiguous and/or unreliable to keep the readers, and Charlie, on their toes. 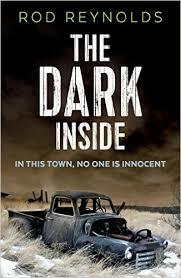 Now a reporter for the Pacific Journal in Los Angeles, Charlie is lying low after dramatically crossing the path of Bugsy Siegel in Reynolds’ previous novel, ‘Black Night Falling’. He is walking a tightrope, trying to fend off Siegel and at the same time working on an assignment which is a genuine mission for him: finding out what became of Nancy Hill and Julie Desjardins, two movie hopefuls who never came back to their boarding house after turning up for a dubious ‘meeting’ with a producer at a Hollywood studio. After meeting with an informant, Charlie is ‘invited’ into a black coupe by mobsters who rough him up and bully him into blackmailing a small-time actor, Trent Bayless, with the threat of exposing the actor’s homosexuality in a newspaper article. Charlie has three days to convince Trent to cough up. If he can’t, and if he won’t write the article and get it published in the Pacific Journal, the gangsters will come back to exact retribution for what Charlie ‘owes’ Siegel. From him and his wife. Charlie visits Bayless and urges him to run away, then manages to talk to a friend of Nancy and Julie and their suspiciously cagey landlady. A mysterious LAPD detective seems to have been around asking questions too, perhaps even shadowing Charlie. The reporter is frustrated, scared and sick of being on the run and forcing himself and Lizzie to live in constant fear for their lives, and he realises he will have to forget about Nancy and Julie, albeit very unwillingly. He decides to plead with Siegel to let go of him and then flee the town with Lizzie. Before he does that though, he meets the LAPD cop whose path he apparently crossed at the boarding house, who actually turns out to be FBI Special Agent Colt Tanner, a secretive man with seemingly limitless powers at his disposal and one obsession: to arrest Bugsy Siegel. ‘Cold Desert Sky’ is an incredibly elaborate mosaic which Reynolds painstakingly builds for the reader, from the immersing first-person perspective of the narrator, Charlie himself. Intricately woven, with a richly textured design, each tile slots into place to reveal unexpected twists, and introduces surprising new characters. From LA, Charlie and Lizzie travel to Las Vegas in their quest to both solve the mystery of the girls’ disappearance – Charlie just can’t let them go, and he’s drawn to Nevada by news that the body of a murdered Jane Doe has turned up in the desert – and nullify Bugsy Siegel’s threat, Charlie glimpsing the possibility of doing so by helping Tanner. Or perhaps it’s Tanner who’s exploiting Charlie and Lizzie for his devious ends. One of Reynolds’ main achievements is keeping firm control of such a devilishly intricate plot, so that only the most distracted readers could find themselves stranded (though I confess that, not having read the second novel in the series, I found the references to it in ‘Cold Desert Sky’, especially those about Charlie’s previous run-in with Siegel, a little too cryptic). What I do question is the fact that Charlie sometimes seems to try a little too hard, hovering between bravery and foolhardiness and losing some credibility as a character in the process. Why, for example, should he want to thrash it out with Siegel after he’s nearly been killed by his men, not for the first time, in the second chapter? Yet Charlie is so engaging a character, and Reynolds is so adroit at handling the plot, that these elements do not detract in any way from the sheer enjoyment of this roller-coaster-ride of a novel. There is plenty more action once the scene shifts to Las Vegas, from sniffing around the Flamingo and the man overseeing its development, Siegel’s sinister second-in-command Moe Rosenberg, to following the hint of a trail leading to Nancy Hill and a brothel out in the desert – Charlie being both helped and stalked by local Sheriff Robert Lang, another law-enforcement agent whose integrity the reporter has cause to doubt. Ultimately, ‘Cold Desert Sky’ is as straightforward as its main protagonist: it’s sheer thriller entertainment, with an adroitly sketched period mood, a cast of well-portrayed characters (even when they’re relatively mono-dimensional, Reynolds manages to add an intriguing brushstroke) and a satisfying plot. ‘Cold Desert Sky’ delivers to expectations, with plenty to spare, and bides well for the next instalment in the series.